The FIFA World Cup of Football 1930-2014. 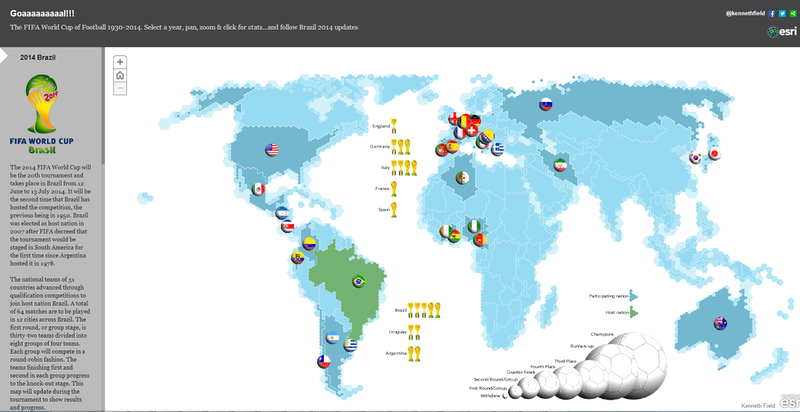 A great map showing The FIFA World Cup of Football since 1930-2014. "The national teams of 31 countries advanced through qualification competitions to join host nation Brazil. A total of 64 matches are to be played in 12 cities across Brazil. The first round, or group stage, is thirty-two teams divided into eight groups of four teams. Each group will compete in a round-robin fashion. The teams finishing first and second in each group progress to the knock-out stage. This map will update during the tournament to show results and progress. For the first time at a World Cup Finals, the games will use goal-line technology to help determine whether balls completely cross the goal-line in the event of a marginal decision. Though FIFA president Sepp Blatter had been a vocal opponent of such technology the disallowed 'goal' scored by Frank Lampard against Germany in the 2010 World Cup became so controversial that moves to introduce technology were inevitable. Had Lampard's goal been awarded, England may very well have gone on to win the game." The official ball of the 2014 World Cup will be the Adidas Brazuca. The name was selected by a public vote that received responses from more than 1 million Brazilian football fans. It is produced by Adidas, the official FIFA World Cup match ball supplier since 1970.